News & Blog: Casino Tips & Tricks | San Diego CA | Golden Acorn Casino and Travel CenterNews & Blog: Casino Tips & Tricks | San Diego CA | Golden Acorn Casino and Travel Center | Page 9 of 9 | Come and Read the latest from Golden Acorn Casino in San Diego's Blog Page! We have great information to help you while you hit the Casinos. Check it out Now! Gamers, you’re in it to win it, right? Playing casino games is fun, sure. But winning? That’s a whole new level of fun. Well, at Golden Acorn Casino in San Diego, you don’t have to win win to win. When you join the Player’s Gold Club, you win just by playing! It’s free! All you have to do is present a valid photo I.D. at the Player’s Gold Club booth, and we’ll give you a club card. You can start reaping the benefits right away. At the slot machines: Insert your Player’s Gold Club card into the reader on any slot machine, and as you play, your points will accumulate. At the tables: Present your Player’s Gold Club card to the dealer before you begin to play. The more you play, the more points you earn. You can spend your points on Free Play at the tables or the slot machines. You can also spend them on Bingo, food or non-alcoholic beverages at the Golden Grill, Del Oro Deli, or the Player’s Bar. You can even spend your points on gas at the Travel Center! 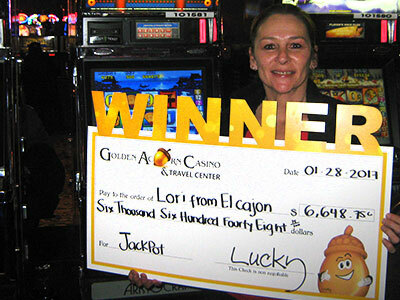 So, yeah, with the Player’s Gold Club at Golden Acorn Casino, you win just by playing. And the more you play, the more you win. As you make your way up through the Club’s three levels, you get more points per play and more benefits, including discounts on food and merchandise, and VIP parking.